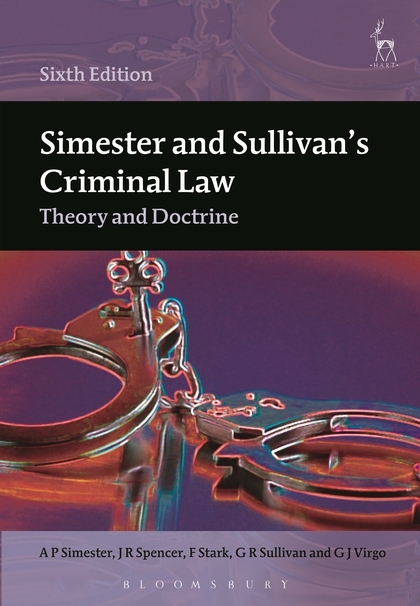 This is the new edition of the leading textbook on criminal law by Professors Simester and Sullivan, now co-written with Professors Spencer, Stark, and Virgo. 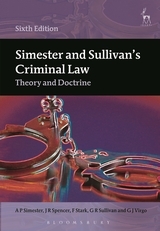 Simester and Sullivan's Criminal Law is an outstanding account of modern English criminal law, combining detailed exposition and analysis of the law with a careful exploration of its theoretical underpinnings. Primarily, it is written for undergraduate students of criminal law and it has become the set text in many leading universities. Additionally, the book is used as an important point of reference in academic writing and postgraduate research in England and abroad. Simester and Sullivan's Criminal Law has been cited by appellate courts throughout the world. The sixth edition is comprehensively updated throughout to set out and analyse all key development in the field with the work's trademark clarity and critical rigour. John Taggart BL, Criminal Law Review. A P Simester is Professor of Law and Provost's Chair at the National University of Singapore and the Edmund-Davies Professor of Criminal Law at King's College London. Findlay Stark is University Lecturer in Law at the University of Cambridge and a Fellow of Jesus College, Cambridge. GR Sullivan is Emeritus Professor of Law at University College, London. GJ Virgo is Professor of English Private Law at the University of Cambridge and a Fellow of Downing College, Cambridge.